The drive had a little bit of everything. Most importantly, it had a lot of New Orleans Saints receiver Michael Thomas. It took 18 plays, gained 92 yards and lasted 11 minutes, 29 seconds — the longest postseason drive by any team in at least 20 years, according to ESPN Stats & Information research. It was the longest drive of any Saints game, regular season or postseason, in that same time span. 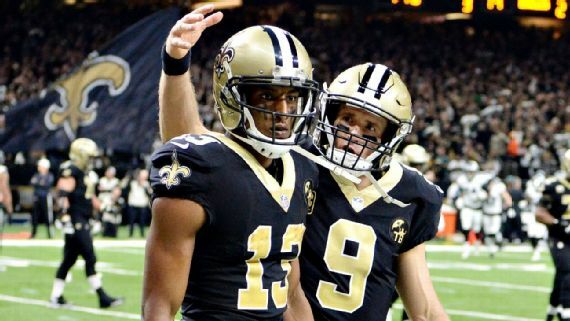 In the end, Thomas’ 2-yard TD catch gave the top-seeded Saints their first lead of the game and allowed them to keep their Super Bowl hopes alive with a 20-14 victory over the Philadelphia Eagles in the divisional round of the NFC playoffs. “It was tough. I mean, it was one of the hardest drive I’ve been a part of,” Saints guard Larry Warford said of a drive that actually lasted 22 plays and forced the Saints to gain a total of 117 yards because of three offensive penalties and one defensive penalty. “I was out of breath getting down there … and everybody is tired. But you smell the end zone and you can’t give it away. You worked too hard for it when we were driving, and we finished it. Saints quarterback Drew Brees laughed when he said someone told him they gained 117 yards. Sunday’s entire game was basically a survival for the Saints, who came out rusty after their first-round bye and immediately fell behind 14-0 thanks to a Brees interception on the first play of the game and two quick TD drives by the Eagles on their first two possessions. And it wasn’t comfortably over until Saints cornerback Marshon Lattimore came up with his second huge interception of the game with 1:52 remaining and the Eagles driving toward a potential score.